Tomorrow may rain, so I’ll follow the sun. I have a video. A video that will make the worst case of Mondays disappear. I feel like the tenth anniversary of the 9/11 attacks deserves saying something here. But the fact is, I don’t know what to say. In some ways I can’t believe that only 10 years have passed. With the war, the fighting, and everything else that followed the events on that fateful day, the passage of time did sometimes seem slow. On the other hand, sometimes it feels as though the attacks just happened, that we are still in the early stages of disbelief and grief over what went on. So I don’t know what to say. I’m saddened by the loss of life on that day and every day after for the past 10 years. I’m sorry for those still grieving. I’m grateful for those who are fighting. I hope in all our remembrances of the WTC that we also remember the attack at the Pentagon and that field in Pennsylvania where passengers took down another hijacked plane before it could find the intended target. Ten years is a long time, but it’s not been long enough for us to recover, to heal. In a way, I think that it’s okay. I think we need, as a nation, to remember feeling hopeless, feeling lost. Remember how quickly we turned to God and faith. Remember how much more patiently we dealt with each other. Remember how we banded together, and really presented a united front. I guess I just hope that we really don’t forget. The story starts as any good story should, with Once Upon A Time. Only, this was not the beginning of a lovely fairytale, but rather the start of a horror story. And Once Upon A Time…it was the name of a little bookstore. In a tale worthy of a Tom Hanks/Meg Ryan movie, the little children’s bookstore operated well on a busy little corner in an area of town that only had one grown-up bookstore a little down the way. When it came to entertaining the literate child, Once Upon A Time was the place to go. Enter the big, bad wolf. In this story, we will call them ZanyB. Or, how about ZBrainy? Either way, they moved in RIGHT ACROSS THE STREET. Poor little Once Upon A Time, it couldn’t compete with the megachain’s low prices, extensive retail line, and playhouse atmosphere. A short time later, Once Upon a Time came to an untimely The End. The only satisfaction I find in this sordid tale is that ZanyB went defunct in 2001. It’s only a slight consolation though. Why, then, am I telling you a tale in which all the characters died over a decade ago? The answer is simple: it is happening everywhere…and it is happening in vicious force right down the street from me. In order to protect myself from the (unlikely) risk of a lawsuit, let’s set up some pseudocharacters. The pawns in this game of sale are as follows: PetshopA, PetshopB, and PetshopC. See? Nice and simple. I have the honour of knowing the owner of PetshopA. He is a regular customer, and someone that we look forward to seeing at night. I love going into his storefront, and his store is where I take my puppy to be groomed. It is the quintessential local store: in a shopping center just a blocks from my neighbourhood, with good prices and a nicely varied selection of products. All good and well. Now, there is a superpetstore a few miles thataway (nods head vaguely in some direction), but we aren’t even going to worry with that now. No, the store we are worried about is thisaway (points in the opposite direction). Just so you don’t get too confused, allow me to provide a handy diagram! 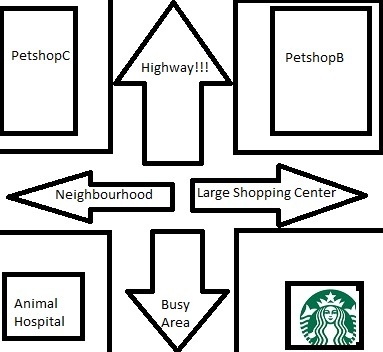 Only the stores vital to your understanding are shown, so of course I pointed out where Starbucks is in the scenario. Just because you’re going to need coffee at the end of this. Continuing with the story…PetshopB has been around for a long time. A really long time. And it is a decent sized store too, several times larger than PetshopA. Because they are far enough apart, there isn’t really a lot-lot of competition. Some, but they have enough breathing room. Enter PetshopC. They are building a new, two story monstrosity RIGHT ACROSS THE STREET from PetshopB. Anyone else remember reading the words RIGHT ACROSS THE STREET in all caps before? (Hint: see second paragraph.) 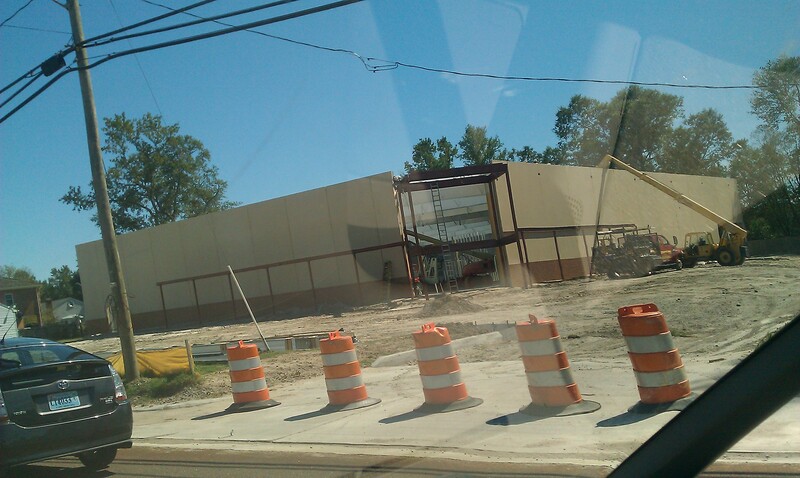 But really, they are constructing a new building less than 100 feet from the existing pet store. At first, my anger was directed solely towards PetshopC. How dare they pick that particular corner! We are already over saturated (oh yes, and there’s an Animal Hospital too, which sells pet supplies as well). We don’t need them in the least…and PetshopA owner assures me that there is not enough demand in this area to support yet another pet supply store. However, as time went on I found myself getting more angry at city planning. Are they really so greedy that they would put a superfluous store on one of our busiest roads just to make a little more money? The answer is “apparently so.” This particular road is already a parking lot in the afternoon/evening as everyone jumps off the interstate and tries to come home. Plus, the main ingress AND egress for a neighbourhood is right at that intersection too. As is one of the main entrances/exits for one of our largest shopping centers. The LAST thing we need on that road is more turning traffic holding up and blocking already congested lanes of traffic. Oh yeah, and we are in a recession. Perhaps someone should have informed city planning of that little detail before they agreed to this. Not to mention that the building is ugly. And huge. I told you it was ugly. In talking with Mr. PetshopA last night, he predicted that PetshopB would last about another year. In all honesty I think that is being very generous, but I will bow to his expertise in this area. Besides, the holidays are fast approaching, so PetshopB may survive a little longer than expected due to holiday revenue. But one thing is for sure: no one is expected both businesses to last, and we expect that PetshopB will be the one to suffer loss. I hope I’m wrong, really, I do.